The "Catch and Release" sculpture, made by Team USA - Breckenridge, during the International Snow Sculpture Championships Friday, Jan. 26, next to the Riverwalk Center in Breckenridge. 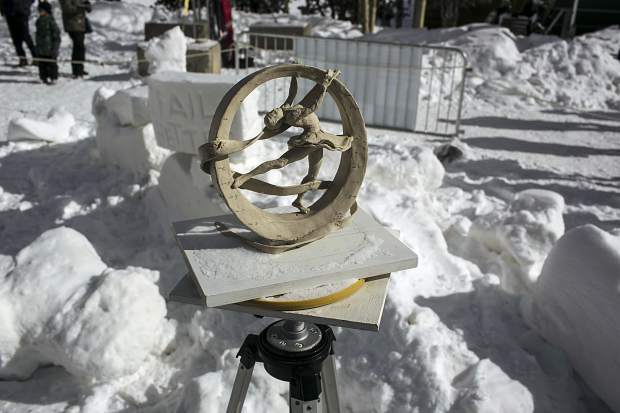 The "Time" sculpture, made by Team Mongolia, during the International Snow Sculpture Championships Friday, Jan. 26, next to the Riverwalk Center in Breckenridge. The "Secret" sculpture, made by Team Mongolia, during the International Snow Sculpture Championships Friday, Jan. 26, next to the Riverwalk Center in Breckenridge. 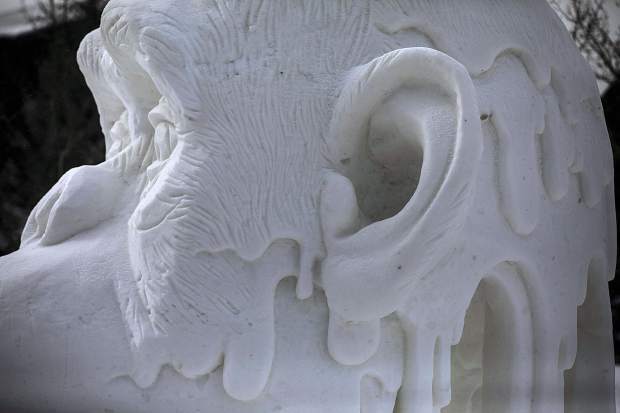 The "Thinker" sculpture, made by Team China, during the International Snow Sculpture Championships Friday, Jan. 26, next to the Riverwalk Center in Breckenridge. The remains of "Ribbon Dancer," which collapsed the previous night, seen on Friday morning, Jan. 26, next to the Riverwalk Center in Breckenridge. The "In Search of Ourselves...Or Our Better Half" sculpture, made by Team Italy, during the International Snow Sculpture Championships Friday, Jan. 26, next to the Riverwalk Center in Breckenridge. 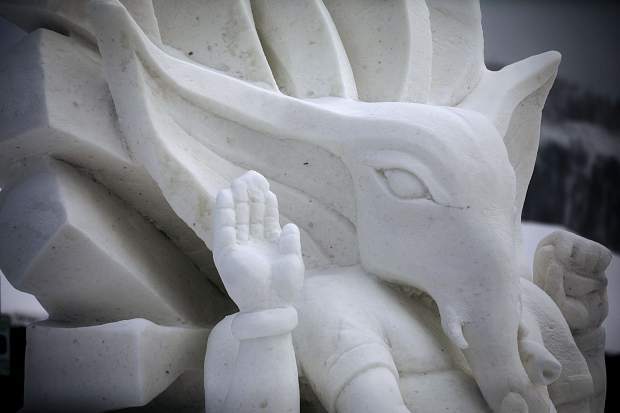 The "Personification" sculpture, made by Team India, during the International Snow Sculpture Championships Friday, Jan. 26, next to the Riverwalk Center in Breckenridge. Vote for the People’s and Kids’ Choice will be announced later. 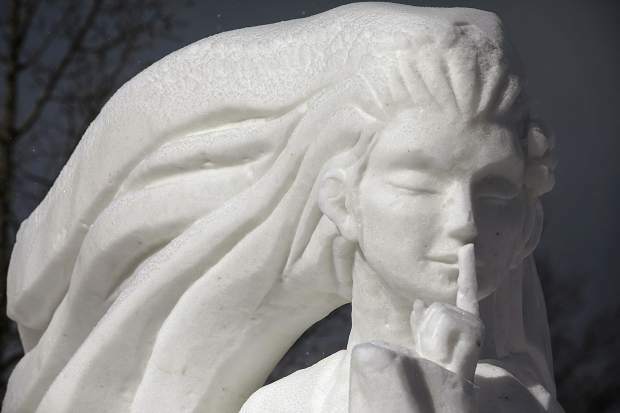 Team Mongolia (Munkherdene) won gold Friday at the 28th International Snow Sculpture Championships in Breckenridge with a piece called “Secrets,” depicting women and their secrets. Last year’s winner, Team China, took silver with the “Thinker,” depicting an orangutan contemplating an apple, and Team USA-Wisconsin (Vogt) took bronze with “Dance Devine,” depicting leaves intricately intertwining. 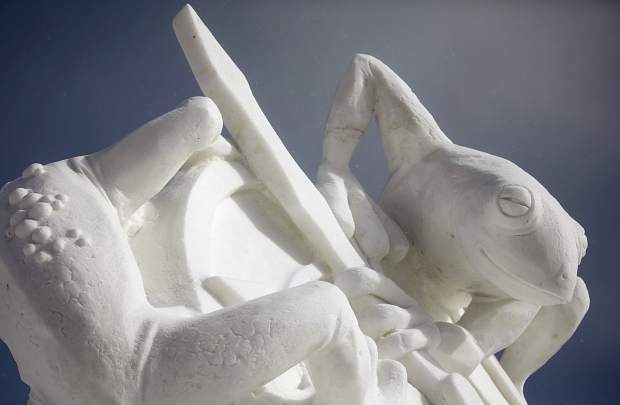 For the contest, 16 four-person teams spent many careful hours combined on each sculpture, crafted from a 25-ton, 12-foot-tall block of snow over the course of four days before Friday’s judging deadline. According to the Breckenridge Tourism Office, a committee sends 250 invitations in June and receives artists’ submissions in August. From there, a selection process narrows the field down to 16 of the very best teams, who then are invited to compete in January. 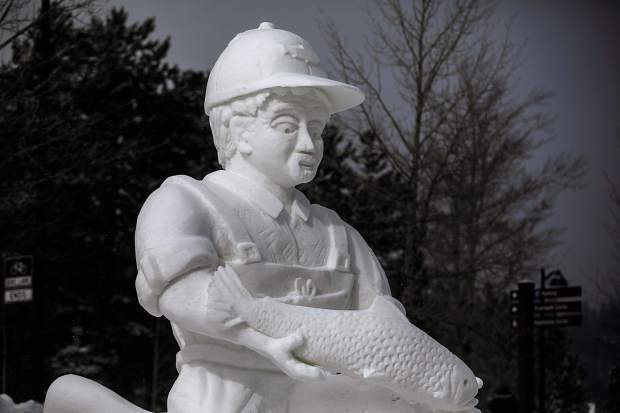 Carving the snow, the artists are allowed to use hand tools and items like vegetable peelers, chicken wire and small saws. Power tools, coloring and internal support structures are strictly forbidden. The teams came from all over the world, representing countries like China, India, Italy, Estonia, Mongolia and Mexico. Four came from the United States, including one out of Colorado and another from Breckenridge. Being the hometown team, Team Breckenridge feels like they have to bring it every year at the International Snow Sculpture Championships. They always try to bring it home, too. 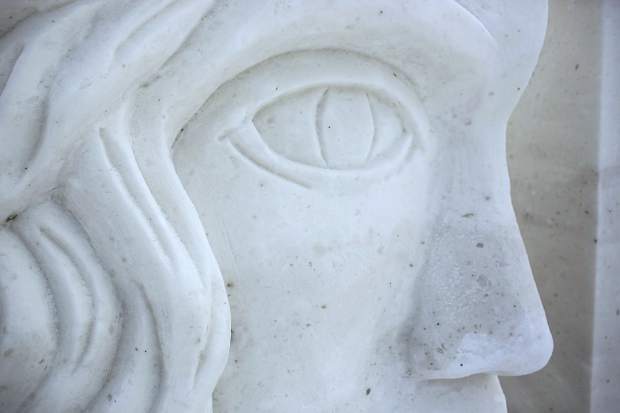 Credited with helping create the event, Rob Neyland said many of the sculptures’ themes are deeply symbolic. He once carved a tribute to the seven crew members killed in the 2003 Columbia Space Shuttle disaster when he was with the hometown team, just to show how deep the sculptures can get. This year’s title, “Catch and Release,” was a tip of the cap to Colorado’s superb fly-fishing, a special piece for Tim West, a long-time Team Breckenridge teammate and the owner of Breckenridge Outfitters. Along with Tom Day, Steve Nguyen and team captain Keith Martin, West helped carve out a risky 12-foot-long fly rod atop river rocks, with three fish, one in the hands of a 12-foot tall fisherman, almost like he’s ready for the picture. Around the fisherman’s ankles, ice suggests a waterline. Mixing conservation and recreation, this year’s idea was formed more than a year in advance, West said, and two years ago, they did a bull rider for a rodeo. Last year, it was a rescue dog for ski patrol. A five-time participant in Breckenridge and two-time award winner, Team USA-Wisconsin (Tomczak) is a heavily decorated snow-carving team. They’ve won at the Snow Days Chicago international competition, in addition to multiple Wisconsin and Illinois state championships and the United States Snow Sculpture Championships in Lake Geneva. On Thursday night, however, their hopes for another title in Breckenridge came crashing down with the collapse of their sculpture. A ballerina, head arched back, twirling a paper-thin ribbon and framed inside a delicate ring, it was an ambitious undertaking that was just a little too thin. But as one of the team members told spectators Thursday night, they went all out, thought they had a design that would win gold and it cost them. Team Mexico’s piece also fell victim to a structural failure moments before the Friday morning deadline. Judges recognized both teams for their willingness to take risks. All of the remaining pieces will be on display outside the Riverwalk Center in Breckenridge through Monday, when the town will take them down and return the parking lot to its normal state.